Famous People of "The Shaws"
Born in Pollokshaws on the 15th of July 1735, was the eldest son and fourth child in a family of twelve. He began his working life as a stonemason but, having artistic ability, he became a part time student in the Academy of Fine Arts in Glasgow. It is evident that he also acquired an adequate general and scientific education, for in 1763 he went to Dublin as a laboratory assistant to a Professor of Physics, with whom he developed a new process for making cameos. They used an easily fusible white vitreous paste with some of the characteristics of glass and far superior to any in use at that time or since. In 1766, with this knowledge and his considerable artistic talent, Tassie went to London where, after a brief period of difficulty, he became established as a maker of quality cameos and intaglios. A cameo is an embossed profile likeness of an individual that fulfils the same purpose as a photograph today. These were in great demand, with rich people sitting for them as they would for a painting. While depicting people's heads in profile was the usual practice, one exception was the cameo of William Pitt, the Prime Minister, where the subject is portrayed three-quarter face. There was great demand for cameos of prominent people both living and dead, the latter being taken from paintings or busts. Intaglios were gemstones engraved with classical or contemporary designs or symbols. Samples of Tassie's work were exhibited annually over twenty years at the Royal Academy and his fame spread far afield. In 1781 Catherine the Great, Empress of Russia, ordered a collection of his work, which was completed in 1793 and consisted of 15,000 items. This collection is now housed in a special room in the Hermitage Museum in Leningrad. James Tassie died in 1799, and was succeeded in the business by his nephew William Tassie who, in time, bequeathed 16,000 specimens of his uncle's work to the National Gallery of Scotland. Many examples are exhibited in the Scottish National Portrait Gallery and a selection can be seen in the Huntarian and the Peoples Palace Museums in Glasgow. Was born in Pollokshaws in 1778. When he died in 1850 he bequeathed £22,000 for the 'Practical Education for Boys', and a school named after him was founded in Cathedral Street in 1854. Was born in Pollokshaws in 1789. He later attended the Parish School until he was twelve years of age, then became an apprentice weaver in a cotton mill. He was a clever lad and within six years he was a clerk in the mill and was giving voluntary tuition to his co-workers, religious instruction on Sundays and elementary education on weekday evenings. By the age of twenty-five he was a teacher in Glasgow and an elder in the Tron Kirk, the minister of which, the Rev. Stephen McGill (previously minister of Eastwood Church) helped him to establish a private school in the city. Five years later, in 1819, William Collins, again with the help of Mr. McGill, opened a bookshop and made a humble venture into publishing. The venture prospered, and thus was founded the great publishing concern of William Collins Sons & Co. Ltd., one of the largest in the world until recent years. 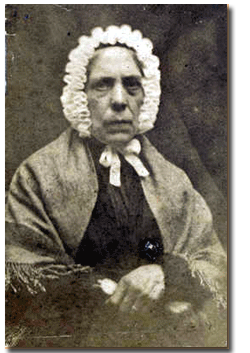 Daughter of Robert Burns, Scotland's National Bard, married John Thomson who had been a soldier, then was a handloom weaver in Pollokshaws. They are reputed to have lived in Shawlands in a building that stood between Abbot Street and the present day Minard Road, but latterly lived in Pollokshaws. Betty Burns was born in 1790, and when she died in 1873 she was buried in the Old Vennel graveyard where her tombstone can be seen. She had a daughter, Margaret, who married David Wingate a Pollokshaws weaver and poet of some local fame. Moderator of the General Assembly of the Church of Scotland in 1947, was born in Pollokshaws and baptised in the Pollokshaws Parish Church of which his parents were members. Was born at 59 King Street, Pollokshaws in 1879. His father was a potter at Lockhart's Victoria Pottery in Cogan Street; his mother was a weaver from Nitshill who came to Pollokshaws to work in the Auldfield Mill, also in Cogan Street. He received his elementary education at Pollok Academy and, as a young man, obtained a degree from Glasgow University and became a teacher in Lorne Street School, Govan. He was already taking an active interest in politics, and in 1903 he joined the Social Democratic Federation, a revolutionary organisation of which he formed a branch in Pollokshaws, holding weekly meetings at the Shaw Brig or in Towns house Square. But his political activities and uncompromising attitude brought him into conflict with Govan School Board and eventually he was dismissed. Paradoxically the Eastwood School Board allowed him to teach Marxist economics at an evening class in Sir John Maxwell School and paid him for doing so. In the mid 1900s he lived with his mother at The West, in a room-and-kitchen in a small building of four dwellings called Low Cartcraigs that stood on the south side of Cowglen Road east of the railway bridge. In 1907 he brought the young destitute Russian refugee Peter Petroff to Pollokshaws, who lived with the McLean's for a time. He opposed the 1914/18 war that he regarded as being inspired by capitalistic interests, and championed the cause of industrial workers and approved of the Russian Revolution in 1917. His speeches on these matters were regarded as seditious and he was arrested and imprisoned in 1916, 1918 and twice in 1922. In 1917 along with the Russian Revolutionary Leaders Lenin and Trotsky and three others, he was appointed honorary president of the first all Russian Congress if the Soviets. Later he was appointed Russian Consul in Glasgow, but this was only a gesture as at that time there was no diplomatic relations between Russia and Britain. James McDougall, son of the last-but-one Provost of Pollokshaws who served from 1905 to 1911, was one of McLean's main supporters. 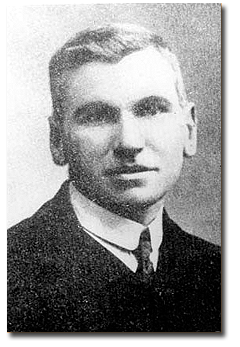 John McLean died, aged 44, at his home at 42 Auldhouse Road on the 30th of November 1923. On the day of his funeral thousands of Clydeside workers gathered outside the house in tribute to his memory and, led by the Clyde Works Band (Ironworks? ), marched to Eastwood Cemetery. Each year after this, on the first Sunday in December, there was a silent march from Eglinton Toll to the cemetery in which, for a few years, some thousands took part. But as time passed the numbers decreased until in 1947 only around fifty attended, and thereafter the march was discontinued. On the 2nd of December 1973 a granite commemorative cairn was unveiled by McLean's two daughters on the site of the old Towns House in Pollokshaws, with the Provosts of Glasgow and Edinburgh, and others, in attendance. The inscription on the cairn describes John McLean with the words FAMOUS PIONEER OF WORKING CLASS EDUCATION. HE FORGED THE SCOTTISH LINK IN THE GOLDEN CHAIN OF WORLD SOCIALISM. It has been explained in a biography that the words 'working class education' does not mean orthodox adult education, but 'the schooling of the masses of workers in the basic principles of Marxism'. it can be assumed that 'socialism' in this instance is McLean’s conception of the word and not that of the Labour Party since the 1970s. In 1979 the Russian Government issued a commemorative postage stamp to mark the centenary of his birth. Was bo rn in Pollokshaws in 1885, where his father was headmaster of Pollok Academy. Maxton junior obtained a degree at Glasgow University and became a teacher. His political views were similar to John McLean's, and for a time they worked together for their cause in Pollokshaws, but apparently with little local support. Like McLean, Maxton's political activities in Glasgow brought him a term of imprisonment in 1916, but the friendship endured until McLean's death in 1923 when Maxton was a pallbearer at the funeral. 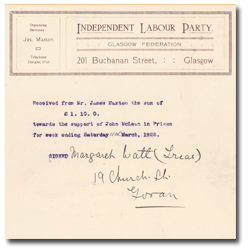 But they followed different political paths with McLean becoming a Marxist, while Maxton followed left wing socialism by joining the Independent Labour Party (ILP) in 1904, the members of which gained notoriety during the 1920s as the Red Clydesiders. As his party's candidate Maxton became Member of Parliament for Bridgeton, Glasgow, in 1922 and continued to represent the constituency until his death in 1946, having served as Party Chairman for two five year periods. He was a popular figure in the House of Commons and was noted for his oratory, and but for the loyalty to his small Party he might have held office in a Labour Government. He wrote two books on political subjects and an autobiography, and has been considered to be of sufficient importance to merit an entry in the Encyclopaedia Britannica. In 1830 Mr Robert Barr of Falkirk started a cork cutting business servicing the local trade. This venture flourished for a while until the innovation of more modern bottle closures caused a decline in the need of cork. This prompted his son, also named Robert, to set himself up as an "aerated water manufacturer" in Falkirk in 1875, supplying to a local population of 40,000. Twelve years later, in 1887, his son Robert Fulton Barr, started a soft drinks' business on his own account in Parkhead, Glasgow. Although the Glasgow base was an offshoot of the Falkirk establishment, it had a much larger population (approaching 1,000,000) to supply. It was this business that was subsequently taken over by brother Andrew G. Barr, who gave his name to the present company. 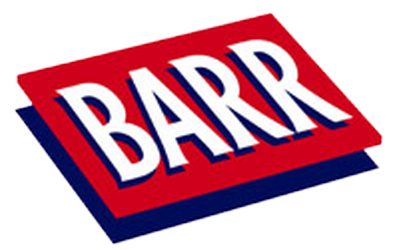 His son, William S. Barr, chairman 1909-1031, who spent some of his life living in the Pollokshaws area, was heavily into product advertising and had always laid emphasis on fitness and strength. He was also a devotee of strong man George Sandow's body building techniques, and was capable of tearing a telephone directory apart. Local athletes were enlisted to extol the "brew's" virtues - Willie Lyon, Celtic - "Best restorative for any athlete" - John Blair, Motherwell - "The tonic properties are just what every athlete requires" and later the great Benny Lynch added his endorsement. Another son of "The Shaws" played defensively for both Glasgow Celtic and Scotland. Never a goal scorer he received 48 international caps from the 23rd October 1948, playing against Wales to the 8th June1960, against Turkey. From the 6th of May 1959 he skippered the team to a 3-2 victory over the then West Germany carrying on as captain until the end of his international career. He played along with such greats as Willie Ormond, Tommy Docherty, George Young, Bertie Auld, Ian St. John and Denis Law. Another "Shaws" boy, probably best known for his current role as DCI Matt Burke in the long running Glasgow based detective series "Taggart". Alex has had a long and distinguished career that has seen him in Dr. Finlay’s Casebook at the tender age of fourteen to roles in other hit shows such as Blackadder, The Bill, Bergerac, Juliet Bravo and The Sweeny, which found him up against another TV Cop legend, John Thaw. Then there are his roles in UK based films such as Bill Forsyth’s Gregory’s Girl, Little Voice where he worked with the likes of Michael Caine and Ewan McGregor and blockbuster movies such as Braveheart which found him working alongside Mel Gibson and Brian Cox, Local Hero set in the north of Scotand where he worked alongside Burt Lancaster, Denis Lawson and Jenny Seagrove. The Patriot Games as Dennis Cooley working with Harrison Ford, James Earl Jones, Sean Bean, Richard Harris and Samuel L Jackson. Chernobyl: The Final Warning where he played Dr. Andreyev alongside Jon Voight, Annette Crosbie and Jason Robards and most recently in The Pirates of the Caribbean: Dead Man’s Chest in which he plays Captain Bellamy alongside Johnny Depp, Orlando Bloom and Keira Knightley. Interestingly Alex had to turn down a part in Peter Jackson’s movie King Kong due to clash with other filming schedules. To find out more about Alex Norton follow the link by clicking on his picture above.